They're not birds, bats or mosquitos - they're all three! They're STIRGES! 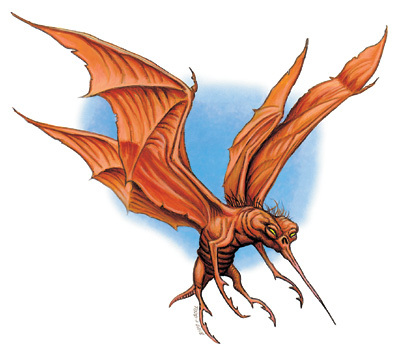 These little bastards are the go-to flying bloodsuckers of Dungeons and Dragons, and are typically portrayed with just the right level of adorable scuzziness. 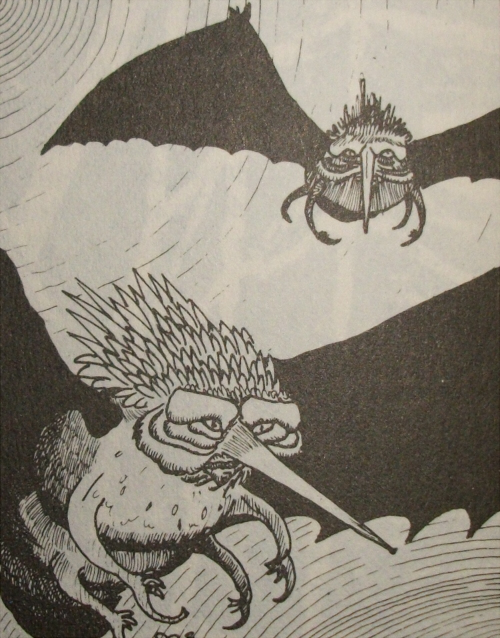 I always liked how old and miserable they looked in the original drawing, like harpies reincarnated as bedbugs. 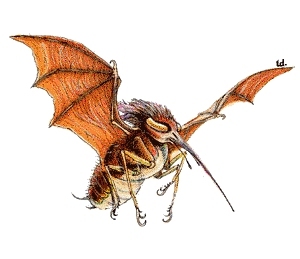 Surprisingly, I can't say I like Tony Diterlizzi's Monstrous Manual Stirge quite as much as almost any other interpretation. I should, since it's basically a weevil's head on a fly's body with bat wings, but where's the love? The 3rd Edition Stirge, I like. It may even be my favorite. It's a leathery, wrinkly, nasty little parasite that seamlessly merges impressions of vertebrate and arthropod in a manner not unlike the beauty of Brundlefly., It's simpler than the others, in a pleasingly wretched manner. Damn near perfect, really. 4th Edition Stirge retains more or less the same anatomy as the previous incarnation, but with a face that reminds me a bit of Brian Froud's goblins. I still prefer the more alien qualities of 3rd Edition's, but I certainly appreciate this one's comically hateful, buzzard-like countenance. I can just see it cackling like Salacious Crumb or a Skeksis. 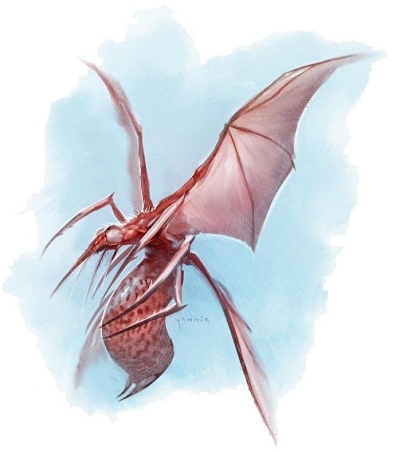 Now, if 4th Edition Dungeons and Dragons isn't your cup of tea, the Pathfinder series of gaming materials utilizes 3rd edition rules and continues to expand upon existing Dungeons and Dragons monsters, more recently updating the Stirge with this fairly neat insect-faced design. 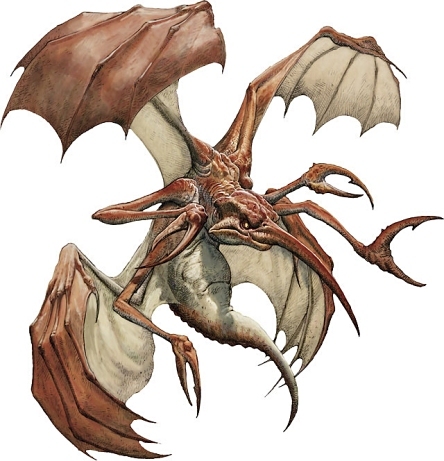 While still not as cool as the previous 3E Stirge, I definitely like its large, pale fly-eyes and bloated, dangling abdomen. Overall, Stirges are a role that could be easily filled by oversized vampire bats, horseflies or mosquitoes, and they frequently are. If you can name it, there are rules for it somewhere in Dungeons and Dragons. Why resort to just a mundane, abnormally large animal, however, when you can surround your players with flapping, screeching hordes of fat, filthy little bug-harpies? Stirges are one of those monsters I always thought would make a totally awesome pet. I would accept any one of its designs if it could ride around on my shoulder all day.